Sri Giriraj stretches out before us as if in an early morning yawn, so close we could reach out and touch Him. Kadambavan, a path of the softest sands cushions our feet. Oh feet, sink deep in the holy dust of Govardhan and let it rise up and purify your existence. We walk against the flow of the pilgrims, a quirk of the buses that spew us out somewhere in Vraj and leave us scrambling to find our location. But all is auspicious with the ample darshan of Giriraj adorning our eyes. A large troupe of monkeys out number us as we enter Surabhi Kund. On the left bank we settle down and Maharaj begins the mangala caran. The prayers to the previous acaryas resound as monkeys and humans, bow to drink the sacred waters. Indra had an anger management issue. After his attempt of mass assignation during the Govardhan lila failed he approaches Krsna at Surabhi Kund, knowing that he blew it big time. ‘I thought you were a devotee. 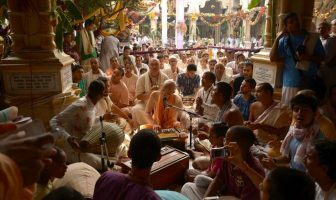 How could you attempt to murder the residents of Vraja?’ Krsna says. ‘I was proud,’ Indra admits. ‘Pride sets us up,’ Maharaj explains. Consumed by the need to be worshipped, Indra forgot that he was simply a representative of Krsna. If we hang around long enough we automatically become ‘senior’ and be tempted by the side benefits of devotional service. ‘We will always find something to be proud about, if we claim ownership instead of offering it to Krsna.’ This is our first meditation. Maharaj shifts gear and zooms in on our weakness as residents of kali yuga. 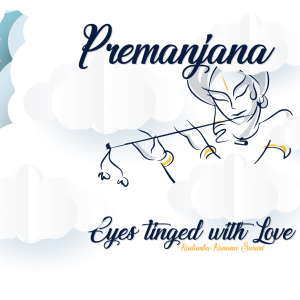 After many days of meditations drawn from Krsna’s pastimes he does a reality check as to who and where we are in spiritual life. We fall short. Even after taking vows it is common to break them. On some level, either gross (breaking principles or neglecting to chant) or subtle (becoming disrespectful and loosing taste) we may fall down. 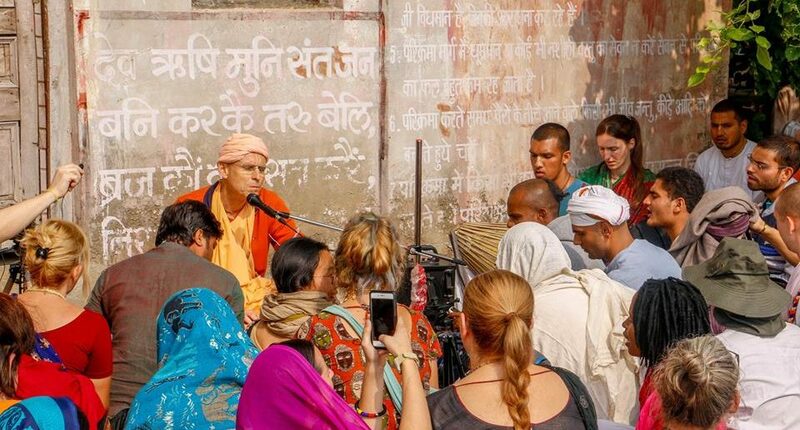 ‘Surabhi Kund is a place significant for forgiveness of our mistakes,’ he establishes the meditation for today. But forgiveness is not cheap. 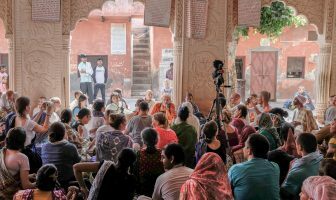 We come to Surabhi Kund remembering all our mistakes but then we must learn what not to do. We will be slapped down if we flirt with the material energy. ‘I didn’t tell any sweet stories of Krsna, but life is not always so sweet, mistakes are not sweet, Indra was not sweet. He messed up. But he took shelter of a devotee (Surabhi cow). If you make mistakes, be humble and take shelter of a devotee.’ He sets the second meditation. After a hide and seek breakfast with the monkeys we continue to the tail end of the peacock shaped Govardhan. The villagers, in a jovial spirit have gathered together to encircle the entire Govardhan with clay lamps! The kids are serious about their service, inspecting each lamp for defects before lining them up. Lord Nrsimhadeva. On the roof top, to the side of Nrsimhadeva we gather. Yasoda is putting Krsna to sleep. He won’t sleep without a bed time story. She tells him of little Prahlad and the giant Lion Lord. Lord Nrsimhadeva appears out of the pillar with nails and teeth like thunderbolts. He rips out the intestines of Hiranyakasipu, spraying blood on His golden mane, and wraps them around his neck as a garland. At this point baby Krsna sleeps peacefully. ‘Therefore, I look at Lord Nrsimhadeva as the personification of softheartedness.’ He appears in a full ‘sad aswariya purna’ form to protect a single devotee. Why worship Lord Nrsimhadeva for spiritual protection? Can’t Krsna, the Supreme Lord bestow protection? Did He not protect all the residents of Vraja from Indra’s devastating downpour? Krsna fulfils many purposes at once but Lord Nrsimhadeva has a single focus; to remove the demons from within the heart. As kali yuga residents we are in the remedial class of human beings; human beings with animal tendencies. We come with these animalistic tendencies, special weaknesses, and we pray to Lord Nrsimhadeva for His special Mercy. Maharaj sets the Nrsimha meditation. The view of Govardhan is breath-taking from above with every path way and kund lined with double rows of clay lamps. The vrajbasi s put wicks and oil jugs in our hands eager for us to do a little seva. In the holy land of Vraja, between the pigs and sewage and plastic, exists such devotion that it tugs the heart and reveals a peephole of the spiritual reality. Passing Apsara kund, we turn towards a bustling section of Govardhan at a small temple with large orange gopa standing with an outstretched hand and hopeful eyes. 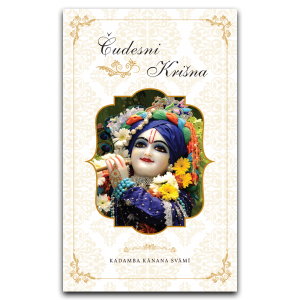 Lota Baba is a cowherd boy who caught Krsna just before He left Vrindavan with a palmful offering. ‘I ‘m just now comming ,’ Krsna said. And 5000 years later Lota Baba is still rooted to that spot, waiting for Krsna. ‘And Krsna will come!’ Maharaj says emphatically. 5000 years and He is still coming? Lota Baba does not just manifest the quality of patience, but strong faith that makes patience possible. 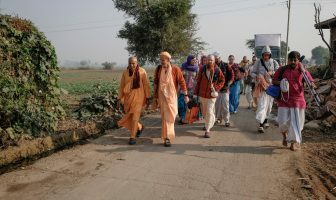 We walk now in the flow of the pilgrims to a not-so-well- known cave of Campakalata Saki which hosted pastimes of Radha and Krsna. 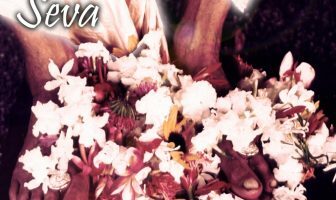 She appears in Caitanya Lila as Raghava Pundit who returns to this cave, as confirmed in the 5th chapter of the Bhakti Ratnakara. The remnants of the cave are tiny as the heads of some tall devotees discover. We offer quick obeisances and proceed long the side of Sri Giriraj. We spot some ‘brown Nila Gai’ (blue deer) on the hilltops. Maharaj says that they are free spirited. As so is he. But where are the buses? After 4km one way and then 3km another way, we do an almost half Govardhan parikrama in unorthodox fashion before sinking back into our seats. One more glimpse of Giriraj and away we go.